How did you determine the end address of the CODE section? If I look at your ROM segment it’s actually quite some bigger. I am currently Reversing a Firmware which looks very similar to yours. I am having Problems with the $GP Value. Is it always the same as the BSS_Start Value? 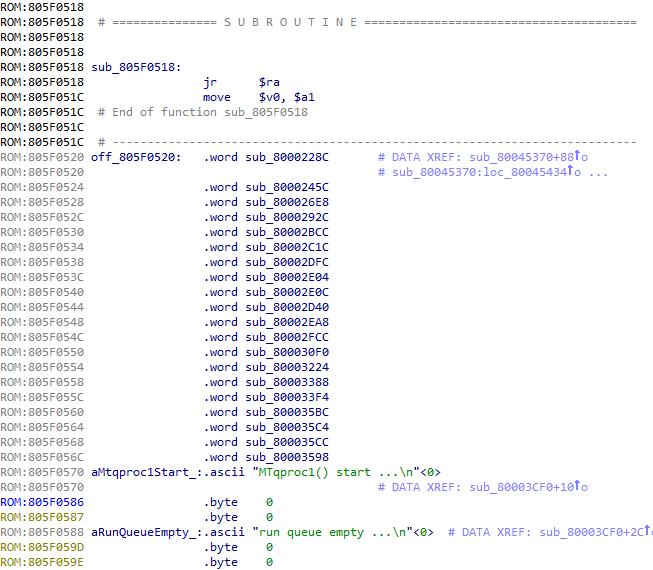 Also, how can I identify where the code segment ends in the firmware? My firmware Is segmented in multiple Instruction sets, then a bunch of .byte etc. and then more Instructions. I can confirm the same method works on VGV7519 (e.g. KPN Experia Box V8). It would be nice if I could diff it against a more functional firmware. were you able to get in the VGV7519? I would like to change some setting which is not available to change for end user. So I am interested in decrypting configuration file. Hello Stefan, I have a firmware that looks a bit confused and I dont know if it is encrypted or compressed? Can you give me any idea what to do if I send you the file?